Collins Booksellers - Born Survivors: Three Young Mothers and Their Extraordinary Story of Courage, Defiance, and Hope by Wendy Holden | Conversation Starters by dailyBooks, 9788828350859. Buy this book online. 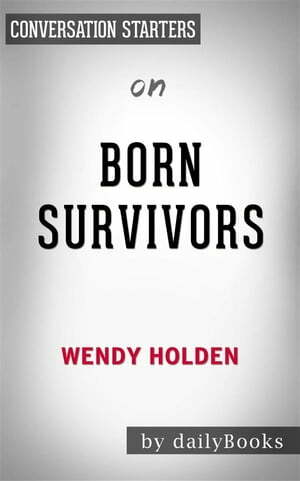 Born Survivors, the latest book from author Wendy Holden, takes place in World War II. Anka, Priska, and Rachel were three Jewish women during The Holocaust. The three women and their husbands were taken to the Auschwitz concentration camp. Their husbands were killed right away. The three women, who were pregnant, lied to Dr. Mengele to ensure that their children could have a chance at life. Anka, Priska, and Rachel all sent to the Mauthausen concentration camp. Priska gives birth at the camp. Rachel gives birth on the train, and Anka gives birth on a coal cart with women dying all around her. Miraculously, all three women and their children survive the Holocaust. Sir Harold Evans called Born Survivors a "moving" account of hope. Booklist commended Wendy Holden for her research skills, and American Jewish World said that Born Survivors is a "spellbinding" tale.